A special ceremony was held Thursday honoring San Diego police officers and first responders who have gone above and beyond the call of duty. SAN DIEGO (CBS 8) - A special ceremony was held Thursday honoring San Diego police officers and first responders who have gone above and beyond the call of duty. Among them, an officer and an EMT who helped save a life of a man who suffered a heart attack during last year's Chelsea's Run. Receiving the Life Saving Citation was officer Tyler Dougherty and receiving a certificate of appreciation was EMT service manager Michele Henderson. 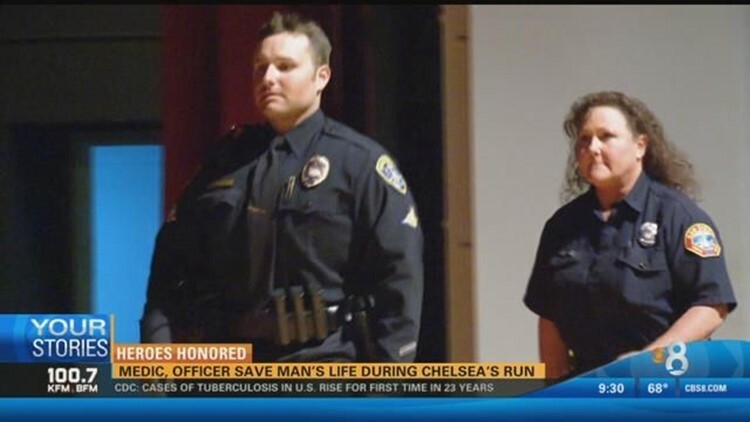 The two were working Chelsea's Run last year when a man collapse from a heart attack at the finish line. "Luckily I had gone through our advance officer training cycle, so I had just done CPR training," said Dougherty. EMT Michele Henderson also ran to the scene. "We just did CPR on him for about four minutes. We were able to shock him twice," she said. The two said they did not give what happened much thought until a few months ago when they found out they were selected for a special award that recognized their work that saved a life. "I just have all kinds of emotions coming through because I'm surprised I even got an award because I was just doing my job," said Henderson. A total of 15 officers were honored for saving lives during the annual ceremony.